The Laguna Seca Recreation Area provides great camping facilities within easy reach of Monterey and Salinas. Fans of racing can enjoy its proximity to WeatherTech Raceway Laguna Seca, while cyclists can use the Laguna Seca Recreation Area as a jumping-off point to the bike trails along the former Fort Ord. Fans of shooting can also enjoy the well-equipped Laguna Seca Rifle and Pistol Range. 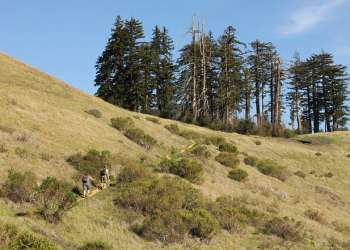 Avid mountain bikers will find that the Laguna Seca Recreation Area provides access to some challenging trails on the former Fort Ord military base. Cycling fans especially recommend these trails in the winter months. During the Sea Otter Classic cycling and outdoor sports festival, visitors can join off-road tours of Fort Ord, or compete in mountain bike races that begin at the Laguna Seca Recreation Area. See the Bureau of Land Management site for a map of Fort Ord&apos;s 83 miles of mountain bike trails. Looking for a clean, safe place to fire a pistol or rifle? Visit the Laguna Seca Rifle and Pistol Range. It&apos;s open Friday, Saturday, Sunday and Monday from 9am to 4pm, with a well-trained staff on hand. Both paper and reactive steel targets are available. You can also purchase ammunition at the Laguna Seca Rifle and Pistol Range. 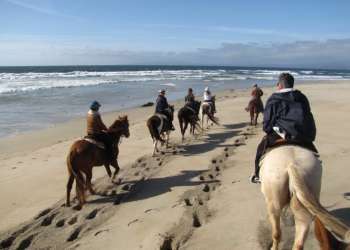 Laguna Seca Recreation Area provides facilities for both RV and tent camping close to Monterey and Salinas. These camping facilities are within a short walk of the Laguna Seca racetrack, ensuring campers are on top of the action during racing events. RV campers can use the Chaparral and Can-Am Circle Campgrounds, both of which feature level black-top sites with water and electricity a dump station. A group building is also available at Chaparral for those reserving 10 or more sites. The Grand Prix campground is open from April 1 to October 31 and provides dirt pad sites for tent camping as well as RV camping. All campgrounds have access to bathroom and shower facilities, as well as picnic tables and fire pits. Make a reservation to camp at Laguna Seca Recreation Area by calling 888-588-2267. There is a $5 reservation fee per site; call for per-night campground fees. From Route 101, take Highway 68 approximately nine miles west toward Monterey. Laguna Seca Recreation Area will be on your right. From Route 1, take Highway 68 approximately nine miles east toward Salinas. Laguna Seca Recreation Area will be on your left.